Do you really need to hire a professional to do your TV wall mount? Or could you get away with a DIY job? Yep, you guessed it! This is one job where you should almost always hire a pro. There are so many factors to think about when wall mounting your TV. With the right experience and equipment, your local technician will make sure everything is done to the highest possible standard and will give you the best possible result. They’ll do a better job in much less time than you could and then clean up their mess so you can get straight into enjoying your favourite shows on your newly mounted TV. Want to know more about what’s involved? We’ve put together a list of 11 (very good) reasons why you should always leave a TV wall mount installation job to the pros. A huge part of wall mounting your TV is actually figuring out what equipment is best for your space and your TV. You can’t just use any old TV bracket – there is a range of types, sizes, weight-bearing guidelines, and functions. For example, you might have an extremely large TV, or you might want to be able to swivel your TV to different angles. A professional will help you figure out the right TV wall mount and make sure it’s a top quality product that’ll do the job. It’s important to make sure you attach your TV securely. If you attach your TV in a spot that’s not strong enough to bear the weight, you risk your TV falling down and breaking (or worse, hurting someone) and expensive damage to your wall. Not only will your technician know the best place to screw your wall mount in, but they’ll be experienced in working with different types of materials and textures, from gyprock and plasterboard to timber and even bricks. When it comes to TVs, don’t mess around with safety. Too many children (and pets) are harmed by falling TVs in Australia. In fact, around 50 Australians per week are injured by falling furniture or TVs, according to the ACCC. To bring this number down, it’s important to anchor any tall or unstable furniture, and where possible, wall mount your TVs. 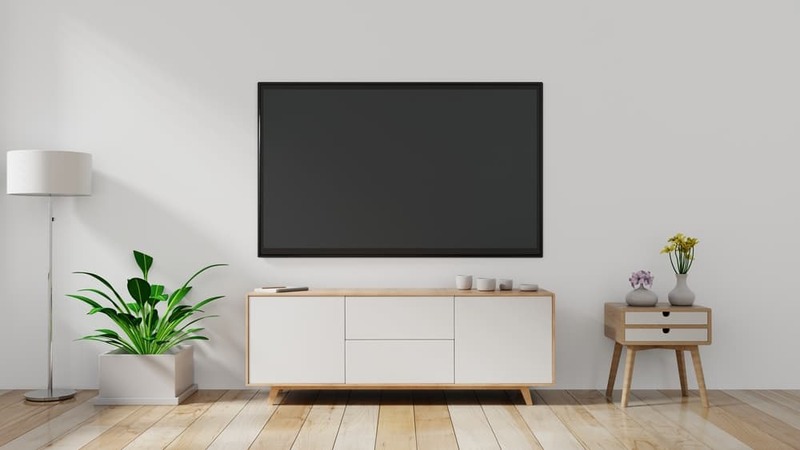 Not only does this cut the risk of your TV falling on someone (if your TV wall mount is done properly), but it means you can get rid of tall TV cabinets which can pose a risk if not secured. Professionally wall mounting your TV will ensure it’s firmly and safely secured. We find that customers who have tried DIYing their TV wall mount before they contact us haven’t quite thought of everything… like the cables and wiring at the back of their TV. You don’t want to go to the trouble of putting your TV up without hiding the cables properly. And cutting into your wall to hide the cables is probably not a job you’re qualified to do. Things a professional will consider include what electrical or plumbing services are located inside the wall, and if anything might block the path to connect up your TV. It’s a serious business that you should leave up to the professionals, or you could risk a leak or even electrocution! A professional who is experienced in TV wall mounts will know the perfect height and angle to secure your TV so that you get the best possible viewing experience. They’ll consider glare from any outside or inside light sources, where you prefer to sit, and how far your TV is from your couch. Getting this right means you’ll be much more comfortable for those late night Netflix binges and shouldn’t need to open and shut your blinds just to be able to see your screen. If you’re not a professional, chances are, the job you do won’t look all that great. At best, it’ll be functional, but the aesthetics will most likely suffer. A professional will do a good job on both counts – everything will work, and it’ll be done so seamlessly that you won’t even notice it. You’ll be glad you invested in a TV wall mount professional, especially when you decide to one day put your home up for sale. Details like whether your fixtures were installed professionally can really impact on the value of your home and whether buyers will trust the quality. Plus, even if you just want to invite a few mates over to watch the footy… you don’t want to explain to them about the dodge job you did on mounting your TV! Getting it right the first time with a professional is a LOT more affordable than trying to DIY your TV wall mount and then getting someone in to fix it. We have so many customers contact us to fix up their botched jobs, and it would have been so much easier (and cheaper!) if they’d just booked a professional from the beginning. Do you have all the best tools and equipment on hand to do a proper job of your TV wall mount? Probably not. And why would you? You don’t have to mount TVs every single day, so buying these tools just wouldn’t make sense. When you engage a professional, they’ll bring their tools onsite so you don’t have to buy or store expensive equipment that you’d only use once. And that’s all before you even get started. Hiring a pro means you can sit back and relax, knowing that all the hard work is done for you. Even if you’re handy with tools and think you could DIY your TV wall mount, you’ll still need to give up your Saturday trying to find the right materials and do the installation yourself. And if you’re not an experienced builder, carpenter, or cabinet maker, it’ll probably take you a LOT longer than that. Either way, it’s time you could otherwise spend with your family, on doing stuff you enjoy, or just relaxing after work. We don’t just install TV wall mounts to use at home. We often install them for businesses too, like restaurants (menu boards), pubs (sports halls and TAB areas), and offices (conference rooms). We get brought in because we’re better and faster at installing TV wall mounts, and the regular staff has much better things to do than fiddle with tech equipment and tools. But the same thing goes for you if you’re a homeowner… your time is better spent playing with the kids, baking a healthy meal, or organising Christmas (it always comes up quickly!). So leave your TV wall mount to the professionals and instead, do something you’re the best at. Want to find out more? Read about the top reasons why our customers always choose a professional TV wall mount installer. Call Australia’s TV Wall Mount experts – we can help! Contact us for a free quote on 1300 800 123 or book in now. We may even be able to get a technician to come out to your place today. We look forward to getting that TV mounted professionally for you so you can enjoy the best and safest viewing experience possible!